May the Calendar of the Heart Say "Resurrection"! Last Supper, Mystical Supper or Secret Supper? Why Did Jesus Weep at the Tomb of Lazarus? For the first time in a thousand years, the largest portion of the sacred relic of Saint Barbara is returning to Orthodox hands, even if it is only for a few days. In a highly symbolic move, the Roman Catholic Church decided to respond positively to the request of Apostoliki Diakonia of the Church of Greece, by giving the entire relic of this great Saint, which resides in Venice, for two weeks. The sacred relic which will be received by Archbishop Ieronymos of Athens and All Greece on May 10th, will be transferred to its place of veneration with the highest honors. It is telling that the coffin in which the sacred relic is kept, will be transferred to the church on the console of a firearm, since Saint Barbara has been the patron saint of artillerymen in Greece since 1828, while thousands of faithful from throughout Greece are expected in Athens to venerate the Saint. 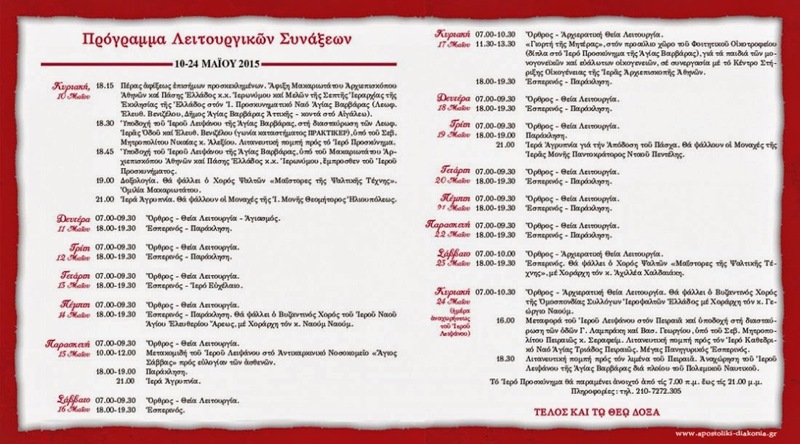 Throughout the duration of the stay of the sacred relic in Athens, there will be morning and evening services. There are also several vigils planned in which renowned monastic choirs will chant, such as that of the Holy Monastery of Ntaou Penteli and the Holy Monastery of the Mother of God in Heliopolis. In a unique and rare event, the holy relic will be transferred to the anti-cancer hospital where patients who are facing their own battle will be given the opportunity to venerate the Saint. Equally honorable will be the departure of the sacred relic from Greece. On the last day of its stay in Athens, which will be Sunday May 24th, the sacred relic will be transferred to Piraeus where it will be welcomed with a doxology. 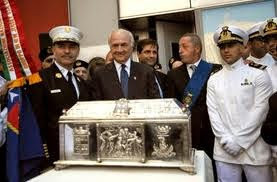 Then the sacred relic will be transferred to a navy warship that will return the sacred relic to Venice. The sacred relic is coming to Greece as part of the celebration of 80 years since the founding of Apostoliki Diakonia of the Church of Greece in 2016, and it will be hosted in Athens by the Sacred Shrine of Saint Barbara in the municipality of Agia Varvara, which received its name in honor of Saint Barbara. This sacred church dedicated to Saint Barbara is a small chapel from the seventeenth century, built on the spot where a wonderworking icon of Saint Barbara was found. (Read more about this shrine here). The sacred relic of Saint Barbara was originally kept in Constantinople, and transferred to Venice in 1003 during the reign of Doge Pietro II Orseolo, when Basil II was Emperor. It was brought to Venice from Constantinople by Maria Argyra (or Maria Argyropoula), who was regarded based on her last name as one of the sisters of Emperor Romanos III Argyros, after she married the son of the Doge, Giovanni. The wedding took place in Constantinople "in capela imperiali" by the Ecumenical Patriarch and the best man was the emperor, who crowned them with golden diadems. Giovanni, who was accompanied by his brother Otto, received the title of Patrician and his wife managed to take the privilege by transferring with her to Venice the sacred relic of the Great Martyr Saint Barbara. In Venice the sacred relic was placed "in capela ducali", or the Church of Saint Mark. Then, in 1009, during the reign of Doge Otto Orseolo, two other children of Pietro II Orseolo, Orso the Bishop of Torcello and Felicita the Abbess of the Monastery of Saint John the Evangelist in Torcello, managed to transfer the sacred relic of the Great Martyr to the church of this Monastery, where it was witnessed in the 18th century. At the time of the Napoleonic disaster the sacred relic of Saint Barbara was transferred to the Church of Saint Martin, on the island of Burano, where it is kept until today.